Here comes Peter Cottontail, hopping down the bunny trail. You know what that means, time to put on your Easter craft thinking caps. In a random stroke of luck I recently discovered a vintage Easter crafts idea book from PAAS full of egg inspiration. One of my favorite projects was an eggshell mosaic lamp. A lamp seemed like a whole lot of eggs, but a pair of earrings was totally doable. Today for I Love to Create let’s make Easter wearable. 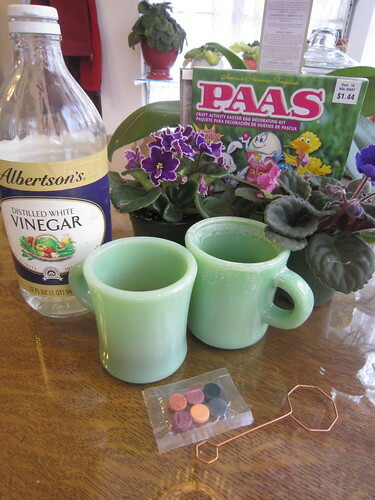 Come on you know you are going to dye eggs anyway. Make a quiche, egg salad or omelet and get crafty with the dyed shells. First I hardboiled my eggs. You can find egg dying kits at most grocery stores. Dye your eggs following the instructions on the package, I opted for hot pink and lime green. Once your eggs are dyed peel the shells. I broke my shells up into pieces. 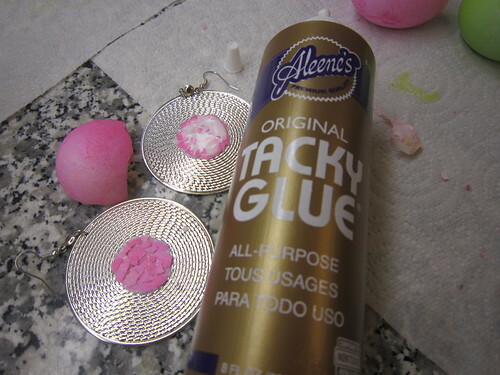 I started my drawing a large circle in the center of my earrings with Tacky Glue. I filled the circle in with pink eggshells. I found the best method was to start with a layer of larger egg shells and then add smaller pieces where there are blank spaces. Once the glue had started to dry a bit I went back over the circle with more Tacky Glue to act as a protective coat and anchor down all my pieces. 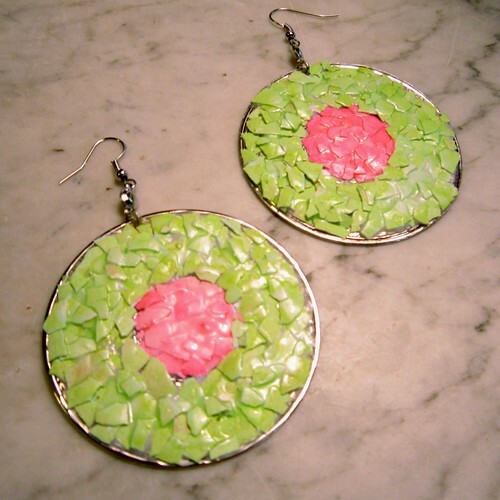 After I did the pink circle I went back and filled in the rest of the earring with green eggshell. 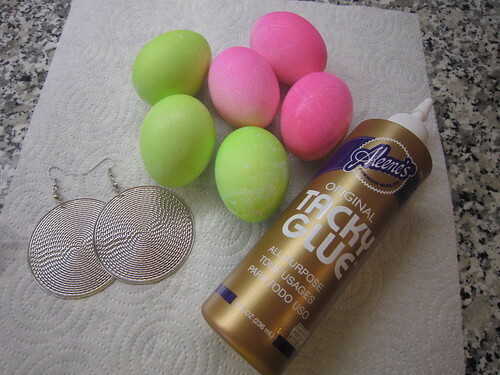 Once you are done you have a pair of earrings so cute you could wear them any day of the year, not just Easter. Posted March 26, 2010 & filed under Easter, I Love to Create, Jewelry. Love it, definitely have to try those the day after! How cute. What a clever idea. My teenager would love them. Love it! I am going to do that. I love those green cups. I am looking for some of those for my kitchen…lol. These turned out great. 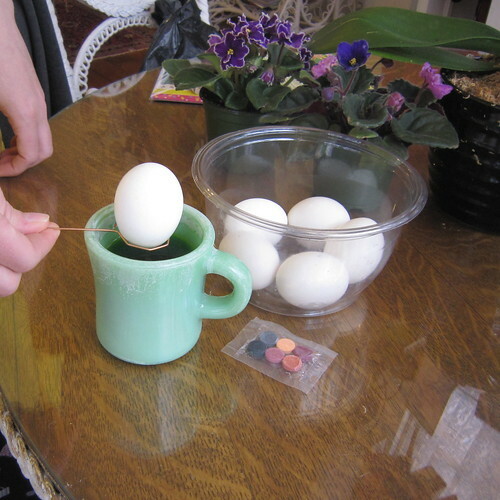 And, I loved dyeing eggs as a kid, so I must try this! Did you have any trouble getting the curvier shell pieces to lay down well? The color is very similar to n2n bodywear. Nice! It's a great idea, but when I peel eggs I always end with bits of egg stuck to some of the shell bits. How do you prevent that?